The spotted, or laughing, hyena was my only inspiration for this post. 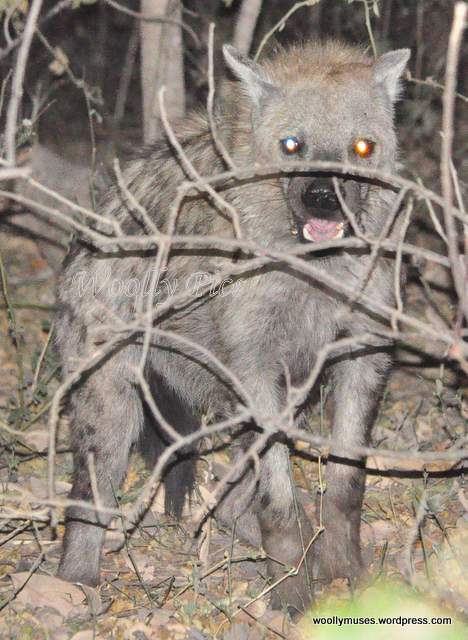 This was my first ever hyena sighting in Kruger National Park. our camp in Botswana last year. This entry was posted in Africa, Botswana, Kruger National Park, Photography, Postaday, PostaWeek, South Africa, Travel Theme, Wildlife and tagged Botswana, Digital photography, hyena, Kruger National Park, nikon d90, postaday, South Africa, Travel Theme. Bookmark the permalink. We just love hyenas; they always seem to be heading somewhere with such purpose (as can be seen in that great first photograph of yours). Many people don’t like them, thinking of them as cowardly scavengers – what’s your opinion Woolly? My opinion of hyenas was not very high prior to 2013, thanks to Walt Disney. I even thought hyenas and Wild Dogs were one and the same. The first one was as you stated…going somewhere with a purpose and to hell with the tourists and their cameras. I just love animals that treat tourists like that 🙂 She came out of the grass and walked down the bitumen past us giving only a glance over her (I think) shoulder once. The ones which came into camp last year were only looking for a feed. 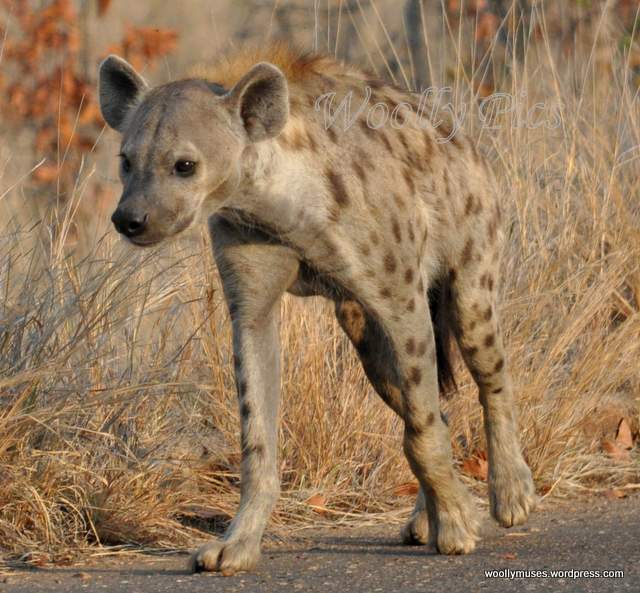 The picture hyena is nervous and was not aggressive…although it could have been, like any canine. I think the flash reflection makes it look more onerous than it was. And the first hyena which came into camp was there also for a feed, but he was arrogant and big and beautiful. Pity that humans continue to feed animals like hyenas and primates that come into camps, it alters their behaviour to the point where the animals become a danger to human life and have to be put down; certainly not doing them any favours. Yes, while it was exciting to see them, we were also aware that they were/are wild animals. Great choice, but oh so scary! He was a nervous young one. The night before we had a big hyena which was arrogant to boot.